Watch a range of exclusive videos - from bite-size coaching tutorials to inspiring player documentaries to coaching masterclasses. (For members only). Bite-sized tips and techniques for taking your game to the next level, whatever your age, featuring expert advice from England's elite coaches. 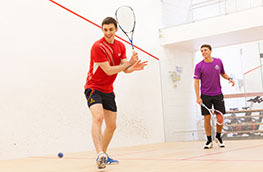 A collection of inspiring short films charting the success of some of the greatest England Squash players of our time. Inspiring masterclasses from world-class elite coaches including David Campion and Paul Carter. Join us backstage for an intriguing and exclusive glimpse into the lives of the pros. Watch inspiring stories featuring local champions.